Wargame: Red Dragon is out now; here’s our Wargame: Red Dragon review. 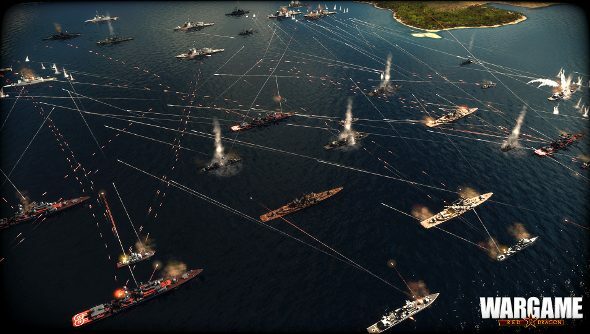 Wargame Red Dragon is a mere week away, launching on April 17th. This is excellent news if you salivate at the thought of giant 20th Century wargames. I do. That’s why I have a bib that I sometimes fold up into a tiny tank. If you own Wargame AirLand Battle, you can pick Red Dragon up with a 33 percent discount and jump into the beta right now. You only have a week left. To get the strategy juices flowing (probably a mixture of oil and… blood?) point your binoculars at some lovely screenshots and trailer below. Red Dragon shifts the action from Europe to Asia, with a focus on Korea. A whopping 450 new units have been added, representing the diverse vehicles and troops used between 1975 and 1991. More importantly, 20 players can fight across massive maps in multiplayer wars.